Often confused with a stye, a chalazion is a lump that appears on the eyelid and can take several weeks to develop fully. It often starts as an irritation and can become more uncomfortable or painful as the lump grows and causes the skin to swell. A chalazion is caused by an inflammation to one of the types of sweat glands in the eyelid. If the duct to and from the gland becomes blocked, caused by the oil within the gland being too thick to be mobile enough to travel through the gland, the oil can build up causing the gland to swell as it fills; eventually a noticeable cyst is formed. As the lump grows the pressure builds up until the lump ruptures causing the fluid to seep into the eye, causing further irritation. Initially the gland can appear red and irritated, as the inflammation develops, the gland swells further causing the surrounding skin to become taut, red and more painful. The lump can become hard as the oil in the gland builds up. Most of the time a chalazion is found solely on the upper lid and does not encroach on the lower lid. It is normally no larger than a small pea and will feel smooth to the touch. Vision is not normally affected although in the presence of a large lump, the eyelid can become difficult to fully open causing partial closure to the eye. This will resolve itself once the lump has been treated. For most, to have a chalazion will be a one off occurrence, but for a small minority it can recur. It is important to recognise the initial symptoms so that a compress can be applied early on to prevent the inflammation from becoming too great. Gently massage given at this time will also help to encourage drainage of the fluid before it is permitted to build up. It is important to try and refrain from popping the lump as this can cause further irritation and possible infection. Apply a warm pad to the area, using clean gauze or a clean face cloth, for up to 15 minutes, three times a day. This will help to thin the built up fluid and dilate the entrance to the gland allowing encouragement for drainage to occur. Do not use a compress that is too hot as the eye area is very sensitive and scalding can occur very easily. Symptoms may subside on their own, often within three days. If symptoms persist for longer than a month, or the lump has popped and become infected it is essential to seek medical advice either from an ophthalmologist or from your GP. Medical treatments may include the use of anti-biotics if an infection has developed possible use of steroidal preparations to help decrease the level of inflammation and occasionally surgery will be recommended. Surgical removal of the lump can include not just drainage of the gland, but total excision of the gland preventing a future occurrence of the same gland. 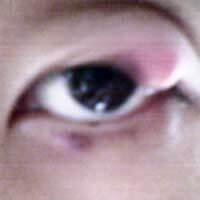 Chalazion are quite common and usual non-serious complaints of the eyelid. Treatment can often be given at home with no need for further interventions.